There is some Potato in these snacks, but the similarity with a Crisps crunch is mere coincidence. There is a crunch but it is a firm and rigid sort of munch. 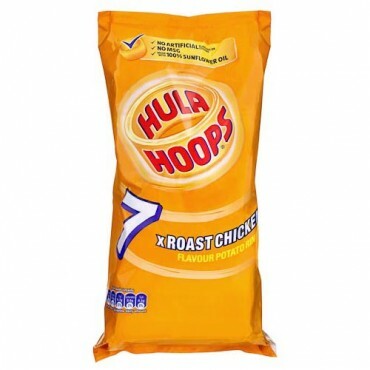 It says Hoops on the bag and that’s what they are. Around a centimetre high and a couple of millimetres thick. The colour is a Crisps yellow, but with a light brownish coloured seasoning powder coating. A Nose Plunge Test revealed a Chicken Stock aroma. The flavour delivered much the same. Reconstituted snacks often feature a more consistent and worthy flavouring that their Crisps counterparts and these fit into that mould.